If health and hygiene are the basic requirements of your family, then it is important you buy the Black and Decker VH802 800-Watt Vacuum Cleaner and Blower with 8 Attachment (White) online from Amazon India. It can be the best alternatives of the ancient broomstick that demands your time and labour. This multifunctional vacuum cleaner comes with 8 attachments, turbo brush for carpet cleaning, soft extension hose to clean difficult-to-reach areas, and a transparent bowl with 9 litres capacity for longer use. Choose the Right Vacuum Cleaner for Your HomeIf you want to live in a neat and tidy home, shop for the Black and Decker VH802 800-Watt Vacuum Cleaner and Blower online from Amazon India. With its 800 Watt of power, it can handle the toughest of tasks. 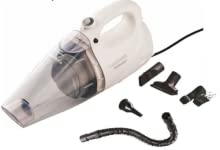 It comes with attachments including vacuum cleaner, multipurpose brush, turbo brush, crevice plus upholstery brush, flexible hose, 2 extension tubes, shoulder strap, warranty card and a user manual to help you keep your shelves, garages and other possible dust collecting areas clean. Its blower function helps in blowing dust and debris from open areas with a cloth bag which is easy to clean. And, if you don’t want to get in the hassle of carrying heavy cleaning equipment, you are sure to enjoy the light weight and portability of this vacuum cleaner and blower from the house of Black and Decker. Clean Difficult-to-Reach Areas with EaseIf you want to enjoy comfort and luxury, electronics can play a vital role in meeting this want. For keeping your home clean and hygienic, you can place an order for the handy and affordable Black and Decker VH802 800-Watt Vacuum Cleaner and Blower online on Amazon India. This vacuum cleaner comes with a number of user-friendly features and accessories that will make the cleaning process much easier and more convenient for you. It can clean any space within a short span of time in an effective manner. With its integrated blower, this vacuum cleaner can remove the dust hidden in every nook and corner of your home. Over the past century, Black & Decker has become a household name, renowned for high quality and innovative products. Making the job easier has always been at the forefront of Black & Decker’s mission. As a brand it constantly strives to simplify the world of DIY and create tools and products that make the task quicker and easier to perform. During the last 100 years, Black & Decker has seen many ‘firsts’, bringing power tools and household appliances to the everyday consumer and changing the world of DIY, a tradition that continues to this day. Black & Decker recognizes the customers desire to keep their home neat and tidy. Hence, Black & Decker has come up with a best cleaning tool for your home. Bid adieu to the conventional ways of cleaning, it’s time to switch to the Black & Decker vacuum cleaners. They are the best in the market in terms of performance, durability and value for money. Black and Decker VH-801 Handheld Vacuum Cleaner is the perfect cleaning tool for you. VH-801 is powered by an 800 watt motor which delivers superior and impressive performance. Its see-through wash bowl can be easily removed and cleaned whenever required. Keep your home clean and free of dust at all times with the Black and Decker VH-801. This Vacuum cleaner features both vacuum and blower functions. 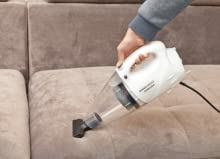 It has a 900ml capacity dust bowl to collect the dust while you vacuum. VH-801 weighs less than 2kg. Its blower function will let you blow out the dust from confined spaces. VH-801 comes with a crevice nozzle, blow nozzle, extension hose and a shoulder strap which helps you carry the vacuum cleaner anywhere. 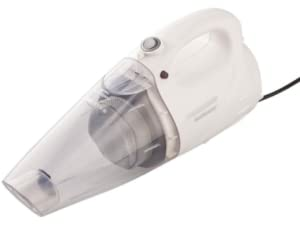 VH-801 is ideal for cleaning your bed, sofa, car floor, mattress, carpets, computer keyboard, television and other electrical gadgets at your home and office. VH-801 is a perfect solution for your quick and thorough cleaning requirements.